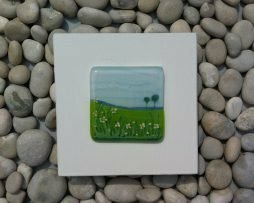 Daisy Meadow is a 12 x 12cm wall panel. Layers of hand painted glass, fired and fixed onto a satin painted wooden mount. These wall panels also have a ‘key slot’ fixing to fit flush against the wall.